Several Tulare high school athletes were recognized by Tulare City Council on March 6 for their achievements on and off the field last fall and winter. 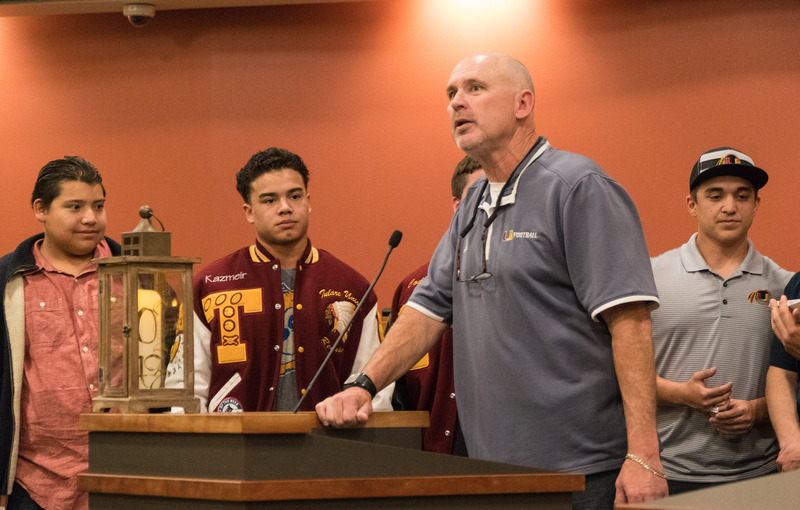 A presentation was made to the Tulare Union High School Football team and coaches in recognition of their CIF Central Section Division II Valley Championship. The team went 13-1 during the 2017 season and 5-0 in their league. In January, Allen signed to the UCLA Bruins Football team. That evening. Allen was also awarded the first annual Kyan Wimbley Award. Wimbley, 13, was killed in a traffic accident in March of last year. The Corcoran High student was returning from his basketball practice in Fresno along with his parents when they were hit by an alleged drunk driver. His parents also died from the incident. Kyan Wimbley’s siblings, Marvin and Marina LeFridge, have started the Kyan Wimbley Award in honor of their little brother. A second presentation was made to the Tulare Union High School Cheer team and coaches in recognition of their 2018 ICU World Cheerleading Championship. “The kids went to Florida and competed in the ICU World Cheerleading Championship, which is essentially the Super Bowl of cheerleading. They beat Belle Chasse High School [from Louisiana] which is essentially the team that has never been beaten before – which is pretty cool,” said Coach Britney Audino. “They are the world champions – they competed against teams from all over the world, beating out Canada, Jamaica – I mean literally all over the world. “They also competed against teams across the nation – placed third, which is confusing, it’s a different championship. They did really well and we’re really, really proud of them. They did qualify to go back next year, so we’re excited about that.